This is the last episode of the String Quilt series! Manon came home and received her present. It was such a pleasure to see how happy she was with her quilt! expected beginning of December... This means of course another baby quilt project! her neutral tune lounge when spread on her white sofa. A gorgeous quilt for a gorgeous daughter!! Congratulations on the new baby!! So exciting! Your daughter is so beautiful and she does look happy with the quilt (no surprise). How exciting to be expecting a little one! Congratulations to all of you! Who wouldn't love that quilt, it's beautiful! Looking forward to seeing what baby quilt that you make. How fun a baby boy! beautiful quilt! she looks beautiful and so happy. oh your going to have fun making baby quilts! String quilts are such fun and yours is especially lovely. Congratulations on the finish. And the upcoming baby; another opportunity to quilt. Your daughter is so beautiful! And she looks so happy! 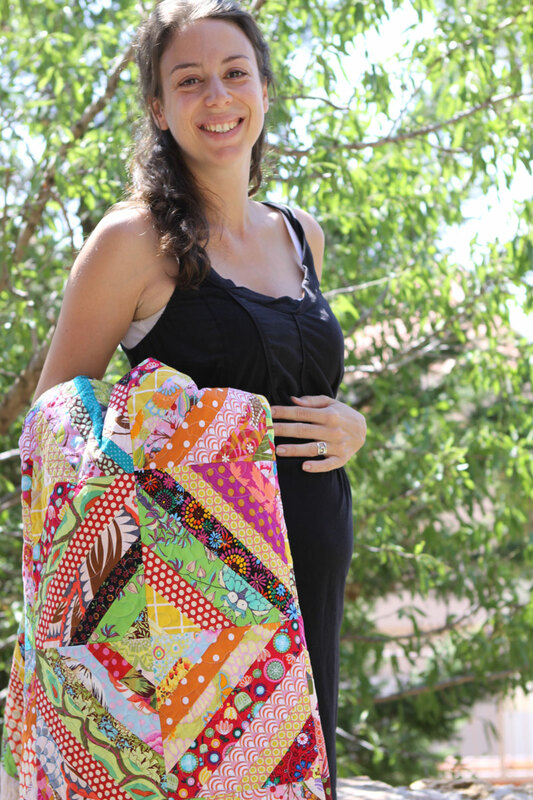 Your quilt will bring her joy every time she looks at it! I look forward to seeing the baby boy quilt in the works! Christine, Congratulations to Manon and the happy grandmother! 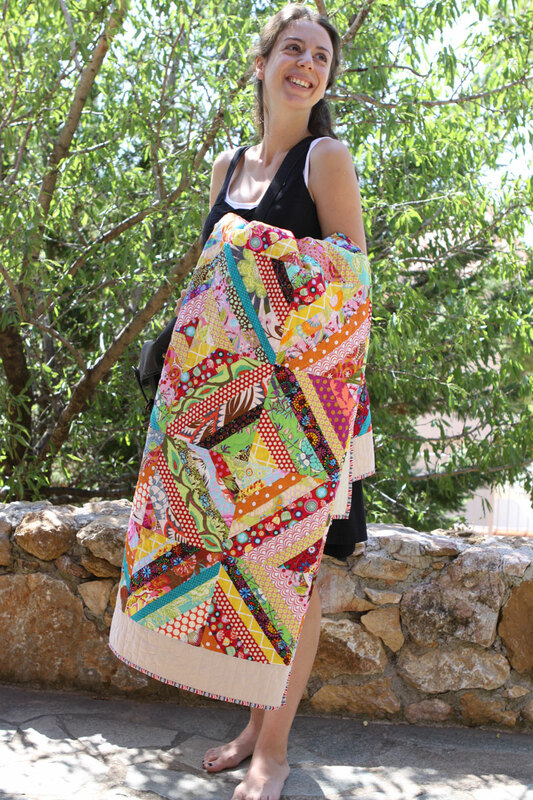 The quilt is gorgeous and Manon is beautiful and looks very happy! Absolutely beautiful, and what great news! Such a joy for your family!!! Congratulations to Manon and to you, Christine! She is such a beautiful girl! I am no at all surprised that she loves the quilt! You must be counting the days until your grandson is born! Yes congratulations! Her smile while holding your gift of the quilt is worth a 1,000 words!!! Beautiful lady with a beautiful name and a beautiful quilt! Myrto, Liliane, Karen, thank you so much for your visit and your kind words. I cannot send you a personal mail as you are "noreply". A beautiful quilt for your beautiful daughter. How exciting to have a little baby on the way......congratulations. 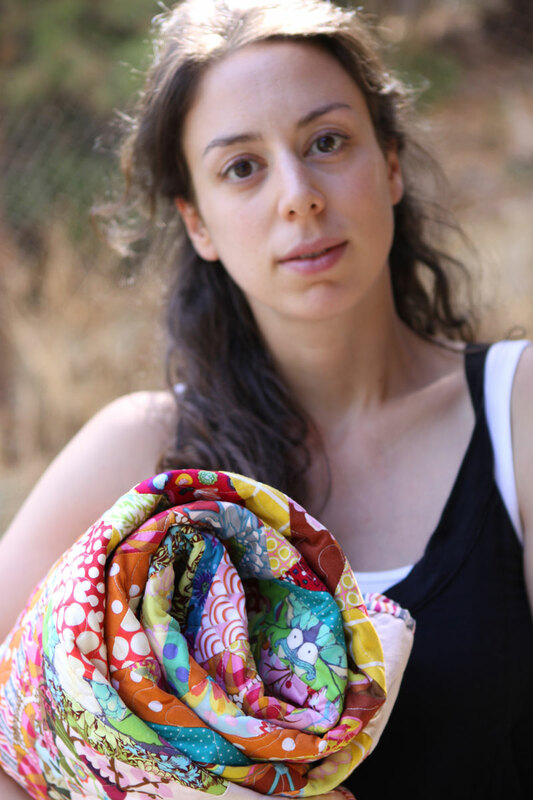 She looks so happy.That`s the best when you gift a quilt...Congratulations to all of you!! What beautiful daughter. She looks so happy.